The Washington Post recently published a story about mammoth retailer Wal-mart’s new policy that allows pregnant women more options so that they can continue to work even late into their pregnancy. While this change of policy is a moral and economic victory for pregnant Wal-mart employees, it did not come without a fight. In 2011, the Equal Employment Opportunity Commission received 5,797 pregnancy-related complaints from women who represented all walks of life from a cashier to corporate executives who felt that they were discriminated against by their employers solely on the grounds of being pregnant. According to the National Women’s Law Center, almost 9 out of 10 women worked into their last two months of pregnancy which carries an increased risk of complications. Rather than allow the pregnant employees to change positions, work less hours or sit in a chair, many find themselves terminated or asked to take a temporary leave of absence that often times becomes permanent. Many are forced to use their Family Medical Leave time before having the baby and must rush back because they’ve run out of time. Tiffany Beroid’s blood pressure started to rise as her pregnancy advanced. Her doctor gave her a light duty note but Wal-Mart told her they didn’t have light duty work, forcing her to take her pregnancy leave sooner than anticipated. 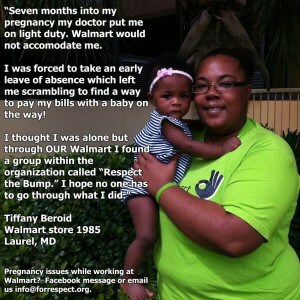 Through social media efforts, pregnant employees of Wal-Mart with problems similar to Beroid’s began networking and an organization called Our Wal-Mart that is a labor union supported group began to advocate on Beroid’s behalf. She was also assisted by a work advocacy group called A Better Balance as well as the National Women’s Law Center. March 5, 2014 became a day of victory for the thousands of pregnant employees of Wal-Mart when the company issued a new policy that allows its pregnant employees to perform less demanding work if they’re having difficulty fulfilling their duties. All pregnant women are encouraged to become familiar with The Pregnancy Discrimination Act of 1978 in order to protect their rights. The policy changes of Wal-Mart are to be commended. Let’s hope other industries will follow suit.